Jennifer Amanda Jones, Ph.D. is the Assistant Professor of Nonprofit Management and Leadership in the Department of Family, Youth, and Community Sciences. She holds a Ph.D. in Leadership Studies (specialization in nonprofit organizations), a M.A. in Nonprofit Management and Leadership, and a B.A. in Global Economics. Her general research interests include nonprofit management, philanthropic giving, and social enterprise initiatives. Dr. Jones received the 2014 Emerging Scholar award from ARNOVA, one of the leading associations for nonprofit sector research. She is a member of Nu Lambda Mu, the international honor society for nonprofit scholars. 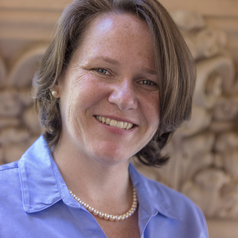 Prior to her academic career, Dr. Jones was involved in highly publicized research projects benchmarking the nonprofit sector in San Diego and in the State of California. Additionally, Dr. Jones has spent more than 15 years working with both domestic and international nonprofit organizations of various types and sizes, including health, human services, education, microfinance, and environmental organizations. She also served on the board of directors for a community foundation.